Mesh extraction is a fast and powerful way to create new parts to your model. Using existing geometry you can quickly and easily create a jacket, a helmet, gloves, whatever your character may need! Mesh Extractions works by separating a part of one model and, in a sense, duplicating that as another mesh. It also ‘cleans’ the edge of the extracted mesh to create a smooth, even boundary. Let’s look at how to create new geometry by painting masks. In this example we will create extra elements for a soldier character. Masks can be drawn quickly, without much concern for the edges. 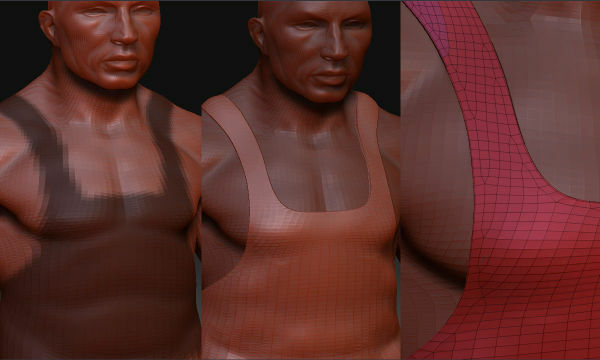 ZBrush will insert extra polygons at the edges of the extracted mesh, to ensure smoothness. In this image we see the mask painted onto our character that we will turn into a flak jacket. Press Tool > SubTool > Extract and ZBrush will preview a new piece of geometry based on your mask. Press Accept to create a new SubTool of this new geometry. Note: ZBrush will keep the masking on the original SubTool. Remember to clear the mask when you no longer need it.